This packable sun hat offers up double the protection as it shields you from the sun. UPF 50+ coated cotton yarn prevents harsh rays from penetrating the hat, so your head is extra protected and stays cooler, too. And, because it keeps it shape after you pull it out of your bag or suitcase, it’s ready whenever you are. Dimensions: 13" x 13" x 5.5"
This is the best sun hat that I have ever had. It is so easy to pack for vacation and super light weight. Perfect for working in the garden, walking the dog, or just topping of an outfit. This hat went with me on a 3 week vacation this summer. It was stylish, breathable, and UV protection was great. 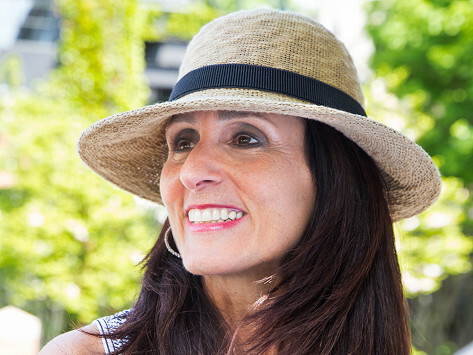 I love the flexibility of this hat and it provides shade without a huge brim. The styles can be worn brim-up or down, making them an attractive accessory for sunny strolls, a day at the beach, or time in the garden.